Normalized deception in the world of politics has spread to proxy voting controversies. A recent white(wash) paper by the Spectrem Group purports to be “providing a voice to retail investors on the proxy advisory industry” by employing a ham-handed survey, which seeks to “educate” respondents through leading questions. The report’s catchy title is Exile of Main Street: Providing a Voice to Retail Investors on the Proxy Advisory Industry. One technique used by the Spectrum Group is to quote previously deceptive research. Although presented as representing the universe of proxy proposals, the Proxy Monitor database contains only a select list of issuers. In contrast Proxy Insight‘s database follows proposals at all public companies in the United States. A quick search of Proxy Insight’s database found that out of 611 proposals in 2017, the three individuals and their families mentioned by Proxy Monitor (myself included) sponsored 110 or 18%, not 25%. Left out of Proxy Monitor’s anlysis is that those proposals averaged 38% support, compared to an average 33% for proposals from all proponents. Thus, it would appear that a small number of conflicted parties may be using low retail shareholder voting interest or participation to leverage their influence in ways that run directly contrary to the preferences of those shareholders. How are the three individual shareholders and their families “conflicted” and how do their proposals “run directly contrary” with the preferences of shareholders? Levels of support for our proposals is generally higher than those presented by other groups, so do not “run directly contrary to the preferences” of shareholders. The paper provides no evidence supporting its allegations. The report contends that “91 percent of retail investors indicated a preference for wealth maximization over political/social objectives.” Investment objectives involve more than binary choices yet survey respondents were asked to choose between “Fully pursue social/political initiatives” and “Fully pursue maximizing returns.” Given that choice, what person saving for retirement or education would choose to “fully pursue social/political initiatives” with their investments? Most people attempt to balance the two, although each person may have different values. For example, one may choose to avoid investing in a company than makes a substantial portion of its profits from slave labor because they find the practice repugnant, while another avoids cancer causing chemicals because potential corporate liabilities may harm profits. We all have a multitude of values and means of expressing them. Most people want to earn money through their investments while also making the world a better place. All investment funds I know of seek profits; I do not know of any whose primary purpose is to support social or political initiatives. Upon completion of the survey, which included industry context, we not only discovered that a large majority of investors support SEC oversight; we found that more than three quarters of investors became more supportive of SEC oversight. This highlights the critical roles of education and communication in informing retail investors. Few respondents professed to know anything about “robo-voting.” The survey then presented “robo-voting” as a “potential issue.” Robo-voting sounds like robocalling or votebots. It is not surprising that 41% of respondents were “very concerned” and 27% were “moderately concerned.” But the definition of robo-voting is never explained in the survey, other than to label it a “potential issue.” Potential issues, by definition are not good. What is “robo-voting?” That is hard to tell. My guess is that it is a term like zombie proxy proposals that has been market tested by a group like the U.S. Chamber of Commerce and found objectionable enough to drive public opinion. Think “death tax” as a substitute term for estate tax. Institutional investors hire proxy advisors to help them research issues and items that appear on corporate proxies, as well as to utilize their voting platforms. Many funds have investments in thousands of companies. They need to vote at hundreds of companies a day during the short proxy season. See Exhibit 1 below from Morningstar. Many proxy advisor clients provide their proxy advisor(s) with proxy voting guidelines, which the advisor uses to pre-populate voting instructions on the ballot. When ballots are ready for review, clients are alerted. They can choose to restrict submission until specified client personnel review and approve the votes or vote automatically, with the opportunity to review and change votes until the voting deadline passes. Voting results often mirror proxy advisory recommendations because recommendations are based on input from clients and commonly accepted governance principles. To call this “robo-voting,” driven by the power of proxy advisors, demonstrates a lack of knowledge the process. If I tell you to vote in favor of all proposals of a specific type, like declassifying the board, and you comply, that is simply following my instructions and should not be considered problematic like unwanted robocalling. 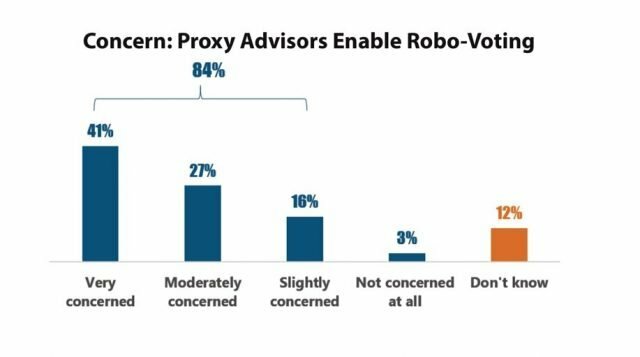 Although the Spectrum Group pretends to be measuring “if retail investors unaware of proxy advisory issues would change their level of support for SEC oversight as they became more knowledgeable,” the report is a better measure of market testing terms, such as “robo-voting” to sway public opinion. We could go over the other four areas identified by the study as “potential issues.” The result would be to highlight similar leading questions and opaque motives. The report is not without some redeeming value. There were a few less leading questions aimed at driving retail shareholder participation. 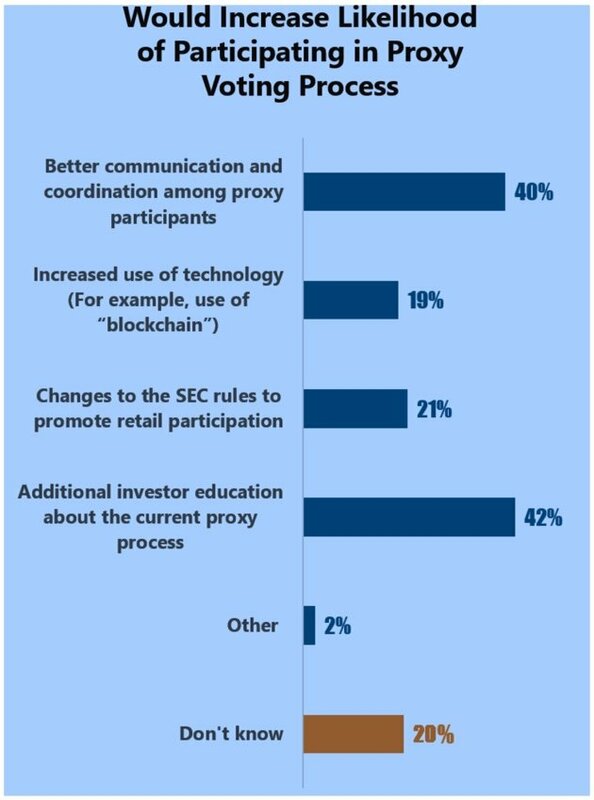 For example, one question asked, “Which of the following would increase your likelihood of participating in the proxy voting process?” Additional education (42%) and better communication and coordination among proxy participants (40%) would make investors more apt to participate. Unmentioned by the report is that the SEC does little to inform shareholders of their rights to file shareholder proposals or vote proxies. Most of Investor.gov is devoted to investors as consumers, not as owners. The focus is on protecting investors against fraud. There is one page on shareholder voting. The last update appears to have been in 2012. While the page discusses the mechanics of voting, it says little to nothing about how to research proxy voting items. Additionally, the survey found investors favored receiving more information on how proxies are voted by asset managers on their behalf. 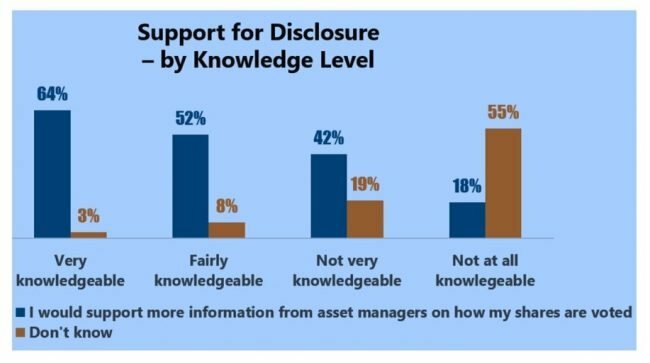 Only 33% of those surveyed indicated “Current vote disclosure from asset managers is sufficient.” That may be the study’s most significant real finding. Most of those surveyed by the Spectrem Group will never vote proxies. They hold their “shares” through mutual funds and ETFs. Since 2003, funds have reported their proxy votes but do so long after news coverage of annual meetings has passed. Votes are filed with the SEC in a format that is not sortable or user friendly. If the Spectrem Group and J.W. Verret really want to empower retail investors, they should advocate real-time proxy vote disclosure in a sortable format. Those holding shares would then be more likely to vote because of improved knowledge of how and why funds are voting as they do. Additionally, fund investors would be able to move their money to funds that vote in alignment with their own values. Many would try to invest with funds that vote solely to “maximize shareholder value,” as J.W. Verret Spectrem Group appear to advocate. Others will try to invest with funds that vote for environmental, social and governance (ESG) improvements for better long-term prospects. Why not let the market decide? Providing more such information would make markets more efficient and would put Mr. and Ms. 401(k) and Main Street investors in the drivers seat. See my Draft Petition to SEC for Real-time Proxy Vote Disclosure at SSRN or at CorpGov.net. Compare the sortable disclosure of Trillium Asset Management under the “Search Proxy Votes” tab, which even includes the rationale for each vote, with that of the Vanguard Index Trust Total Stock Market Index Fund, which makes it difficult to determine voting trends. The Spectrem Group’s next survey should ask if investors want to see the proxy votes of their mutual funds and ETF’s before they are due or a year or more after they are counted. How about asking if investors want those records in unsortable pdf format or in a sortable database to facilitate comparison? I think we can all guess how investors would respond.